Don 2, the need we say highly anticipated high octane Indian action film of 2011, entered the Top 10 UK Box Office on its opening day, December 21st, two days ahead of its worldwide release on the 23rd December 2011. Released by Reliance Entertainment, Don 2 has garnered positive reviews from audiences and critics alike. Don 2 marks Shah Rukh Khan’s best action film to date and sees Shahrukh experimenting with varied looks from debonair to dishevelled as he charms the heart of the audiences globally. Farhan Akhtar sets a whole new benchmark in Indian filmmaking with this latest release, combining, state-of-the art technology, high-tech action sequences and the most gripping and stylish narrative to steal out of Indian cinema in recent years. Don 2, the sequel to the 2006 remake of the Amitabh Bachchan classic, is a stylised action-thriller with a spectacular 3D and 2D experience. The film is injected with the infectious chemistry of Shah Rukh Khan and Priyanka Chopra and also stars Boman Irani who returns to his earlier role as ‘Vardhaan’, and Om Puri, Lara Dutta and Kunal Kapoor who enter the sequel in new roles to add further twists and layers to the intelligently calculated plotline. 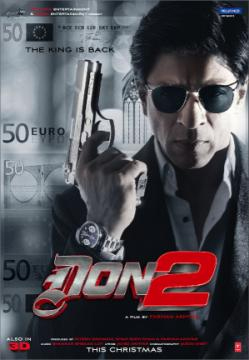 Don 2 is currently open in theaters worldwide!